This page lists websites to explore for further information and research on the Rabaul Nurses and the fall of Rabaul in the Second World War (WW2 1939 - 1945), with emphasis on the tragedy of the Montevideo Maru. Army, Missionary and Government nurses were held in captivity in New Guinea and Japan for more than three and a half years. As one of the captive Rabaul nurses, Alice M Bowman tells their story in her book Not Now Tomorrow. When Japan entered the Second World War on the 7th December 1941 (8th December in Australia) territories fell in quick succession in the South-West Pacific Area; Rabaul was inadequately defended and fell swiftly to the then invincible Japanese invasion force in January 1942 — three weeks before the fall of Singapore. More than sixty-five years have passed since the end of the Second World War and it is hoped the sites listed will evoke interest in the New Guinea campaign and kindle awareness of events unknown. Many young Australian servicemen and women answered the call of duty and many Australian civilians served their country in defence of the Mandated Territory of New Guinea, a protectorate of Australia which came about as a result of the First World War. In early 1942 the Japanese were victorious; Australia's major AIF contingent was far from home serving in the Mediterranean, the Middle East and North Africa and defence of Australia was of grave concern. Of particular interest in this beginning of the New Guinea campaign of the Second World War in the Pacific is the tragic unresolved aftermath of the fall of Rabaul and Kavieng: those many civilians and servicemen who have "no known grave" and those whose graves might, or might not, be at the bottom of the sea in the hold of the sunken prison ship Montevideo Maru. The following sites are but a few of many that can be found, and are growing rapidly, on this website's topic. Angell Productions is a commercial publishing company with an excellent website. A part of this website features a voluntary segment of historical interest dedicated to the Brave Women of Oceania. 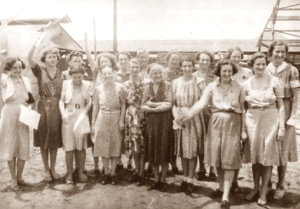 Among the many absorbing articles written here can be found The forgotten prisoners of Rabaul featuring Whytie - Lorna (Whyte) Johnston, one of the six Rabaul Australian Army nurses, who now lives in New Zealand. Readers will also find interesting the article on Sr. Berenice Twohill from the Convent of Our Lady of the Sacred Heart, Sydney. Sr Berenice was the youngest among the Australian nuns of Vunapope Sacred Heart Catholic Mission near Rabaul; the whole Mission was interned on New Britain for the entire Japanese occupation. The Catholic Weekly 19 July 2009. Front page interview with Sr. Berenice, mentioned in the above site. Sr. Berenice Twohill, a NSW Northern Rivers girl of Our Lady of the Sacred Heart Catholic Mission, was interned with her colleagues for three and a half years and is the only Australian nun remaining. This second website from The Catholic Weekly of April 2009 tells the story of Fr Ted Harris, a Balmain, Sydney man of The Sacred Heart Mission in Rabaul. He was almost certainly executed by the Japanese and is among those who have no known grave in New Britain. His courage in helping escapees is recorded in this article. A website created by dedicated, professional people with its sole aim to inspire awareness and seek the truth for all Australians. Positive websites must surely capture the eye of all interested people. Another must visit website (with the same aim as the above) about the feature length documentary "The Tragedy of the Montevideo Maru" screened in November of 2009. Rod Miller's valuable information website which offers numerous historical links for research. My association with Rod Miller began with his visit in May 1997 to purchase Not Now Tomorrow and discuss Grace Kruger's diary. With the assistance of Albert Speer, Rod's priceless colleague, a lot of research has been undertaken in the quest for answers about the Montevideo Maru tragedy. Rod has acquired some of the diaries of the Rabaul nurses, the first being Grace Kruger's from her estate and, with a great deal of help from his copy of Not Now Tomorrow and interviews with Lorna (Whyte) Johnston, Jean (McLellan) Harwood, before she died in 1998, also Dora (Wilson) Dunn and Mavis (Cullen) Cation before she died, the diaries have been pieced together to produce a book as yet not published. Rod Miller's research is now centered on events pertaining to the Montevideo Maru tragedy. The Rabaul and Montevideo Maru Society's new website. A lot of ground-work has been engineered to establish a Memorial that will honour all those whose lives were lost in the Rabaul and New Guinea saga, those whose graves are known and those whose graves are not known, civilians as well as those of the services; commemorations for civilian losses are sadly lacking. This new website has taken over from Keith Jackson's site below to continue awareness of the tragic loss of life, and to raise funds for the memorial. Latest postings and information about all things related to New Guinea with archival articles on the Montevideo Maru tragedy. This site is authored by Keith Jackson AM, ex-Chairman of the Montevideo Maru Memorial Committee and Adjunct Professor of Journalism & Communication at the University of Queensland. He was a teacher and journalist in PNG from 1963 to1976 and past President of PNGAA. The above address is an interesting page from the website of the Papua New Guinea Australia Association about the unveiling of the Australian Service Nurses National Memorial in Canberra. Jenny and Joanne Evans, mother and daughter, have devoted extensive research to their website. Jenny Evans' father was a member of Lark Force and lost his life on the Montevideo Maru. The Lost Lives website is about events effecting the islands and the people of New Guinea in the Second World War. Of particular interest and relevance to Not Now Tomorrow are the pages on the Montevideo Maru and the Rabaul Memorial page (accessed from the above address). Jenny Evans' website is linked to the Australian War Memorial's Australia Japan Project.